RBTH presents a selection of views from leading Russian media on the latest developments in Ukraine, including analysis of the preliminary Dutch report on the MH17 disaster, as well as reports on peace talks between Russian President Vladimir Putin and his Ukrainian counterpart Petro Poroshenko, and war crimes charges made against a pro-Kiev battalion by Amnesty International. 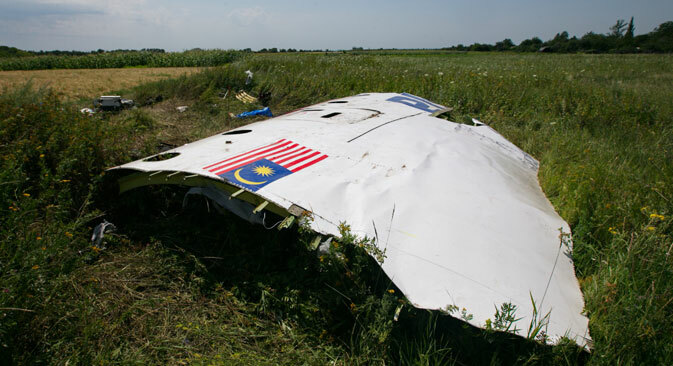 The Kommersant newspaper writes about the preliminary report published by the Dutch Safety Board (DSB) on the Boeing 777 Malaysia Airlines crash in the Donetsk Region, in which 298 people perished. Not having visited the crash site or examining the wreckage, experts, basing their study entirely on photographs of the remnants of the plane, have come to the “already obvious” conclusion that the plane was shot down. Kommersant has learned from one of the Russian participants of the international commission investigating the downing of the Boeing that due to the continuous fighting, experts have so far been unable to carry out the most important stage of the investigation – the field study. That is, examining the scene of the accident, the debris lying on the open ground, following the flight path of the aircraft, and subsequently making a detailed study of the model in order to define the area of shrapnel fragmentation, the type of fragments, and at what distance the explosion took place. Instead, the experts spent three weeks in Kiev, participating in endless meetings. The Moskovsky Komsomolets newspaper writes about the release of the poet Yury Yurchenko, a citizen of Russia and France, a well-known playwright, actor and creator of the theater association Les Saisons Russes (Russian Seasons) in Paris. He accompanied the pro-autonomy militants during their withdrawal from Slavyansk, and was personally acquainted with Pavel Gubarev, head of the unrecognized Donetsk People’s Republic, working as his assistant in preparing websites for the militants in French and German. During the battle for the town of Ilovaisk, south of Donetsk, Yury was captured by Ukraine’s Donbass Battalion. After a subsequent exchange of prisoners, it was discovered that he had a broken leg, fractured ribs, and a brain concussion. Meanwhile, Moskovsky Komsomolets has also learned details about how prisoner exchanges have been carried out in Ukraine. In just a few months of the war, this has become a profitable business, despite the fact that money and ransom payments – unlike during the Russian campaign in Chechnya – do not play a major role. Rossiyskaya Gazeta writes about war crimes charges that have been leveled by Amnesty International against the pro-Kiev volunteer Aydar Battalion. The shocking figures were presented personally by the charity’s secretary general, Salil Shetty. According to him, the Aydar Battalion is guilty of kidnappings, illegal detentions, robberies and extortions, as well as having subjected civilians to harsh treatment and possibly carrying out executions without a trial.